Going on a trip is usually thought of as a wonderful experience, one that you and your family may have planned and looked forward to for some time. To have the most fun – to get the most out of the experience – it’s important that you and your loved ones have the means to overcome those little ailments and discomforts that can make the experience range from mildly unpleasant to downright unbearable. How can we include a little ‘Trip Insurance’ to our already overstuffed carry-ons or mini-vans? 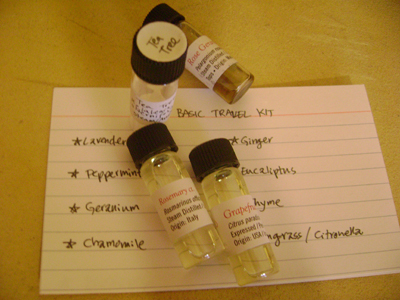 Aromatherapy has an answer with some readily-available essential oils. Motion sickness, bug bites, digestive difficulties, and general travel weariness – to name a few – are common discomforts experienced when venturing away from home. A small collection of inexpensive essential oils can provide great relief from these amusement-threatening ailments. ‘Treatment’ with these oils is simple – ranging from inhaling a little oil from a tissue, to adding to a bath, to drinking a drop with a warm cup of water. And, thankfully, relief often comes quickly because of the oils’ powerful properties and compatibility with our own bodies. We’ll begin with ‘getting there’ – any trip starts with travelling. By car, boat, plane, or otherwise, motion sickness commonly effects many people, particularly children. This can easily make the ‘travelling’ portion of your experience absolutely no fun. Enter Peppermint essential oil. Peppermint has long been used to calm uneasy stomachs, and is easily used. One drop (it is strong!) in a cup of warm water, sweetened if you like, can be sipped before and during the voyage. For the fussy ones, a drop can be added to a small amount of honey and taken from a spoon for the same effect. Ginger essential oil is also known for its calming of upset stomachs – a little inhaled from a tissue or diluted in a carrier oil and rubbed on the abdomen can bring relief. One can also add a drop of ginger to warm water and drink as a strong tea – this may be effective for some food-related stomach issues as well, particularly when combined with the abdomen massage method. Lavender essential oil is also an effective wound-healer because of its anti-inflammatory, mild antibacterial, and skin-regenerative actions. It can be used directly in case of burns, mixed 50:50 with Tea Tree and put on band aids to prevent infection, or blended with Thyme Linalol and Eucalyptus (2:4:2) and added to a bowl of water for an effective disinfectant wash. Lavender is very useful for treating bites and stings – just place a little ‘neat’ (undiluted) on the affected area. This versatile oil is also a component of an insect repellent blend comprised of equal parts of Lavender, Thyme Linalol, and Peppermint, and a double-dose of Lemongrass essential oil. A drop or more placed on tissue or cloth about your room can keep the insects out of your space; 3 drops of this blend per teaspoon of carrier oil can be regularly applied to the skin – or you may mix a similar amount into any lotion you may have. To get yourself into the swing of local time, relax and be ready for bed with equal parts of Lavender and Geranium essential oils – Chamomile may also be used in place of the Geranium, and works especially well for soothing children (if they are irritable for ANY reason). Add a few drops to a bath or use in a massage oil. For a morning eye-opener, do the same using equal amounts of Peppermint and Eucalyptus. You will find these useful at other times when you need a little clarity and lightening-up. Lemon Oil – the Purifier Lemon also has some wonderfully diverse uses. It is effective as an antibacterial, but not so strong as to be an irritant. Adding several drops per quart to your drinking water will help purify it, and the water can act as a disinfectant to be used in washing your fruits and vegetables – the need for this certainly depends on your location, but it not a bad idea whenever bacterial contamination may be a possibility. Further, regularly drinking water with added lemon oil can gently stimulate the lymphatic and digestive systems, helping alleviate that sluggish feeling that often accompanies extended plane and car travel. Eucalyptus – the Narrow Leaf variety is a favourite – has a great range of uses as well. It can cool the body when too hot, and protect it when too cold. It is found in almost all formulas used to relieve congestion, can support circulation, and bring lightness to a travel-weary head. For more on natural health and holistic therapies, do join us on The Therapy Book. Just click on the book below. Misty Rae Cech, ND, is a naturopath and yoga instructor practising in Boulder, Colorado. She is the owner of Ananda Aromatherapy and Anandaapothecary. When should common knee pain be treated as arthritis?